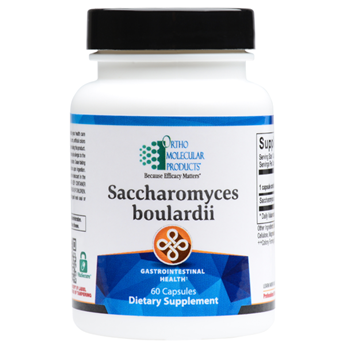 Saccharomyces boulardii is a health-promoting, probiotic yeast. It was first identified in the 1920s by French microbiologist Henri Boulard. Since its discovery, there have been 250 peer-reviewed articles examining S. boulardii, making this one of the most studied probiotics available. S. boulardii is a non-pathogenic yeast and is distinctly different from Saccharomyces cerevisiae, or "brewer’s yeast." S. boulardii has been shown to support gastrointestinal health by boosting secretory IgA (sIgA) levels. sIgA is an immunoglobulin (protective antibody) that is found in the digestive tract and in mucosal secretions throughout the body. Maintaining healthy sIgA levels is crucial for supporting immune health, particularly in the gastrointestinal system, which is exposed to pathogenic organisms and viruses. sIgA acts as the first line of defense against foreign invaders in the gut by attaching and neutralizing proteins that are unrecognized by the body. Depleted levels of sIgA are often found in people with low immune response, food intolerance and dysbiosis. Dysbiosis occurs when fewer than normal probiotic organisms and an overabundance of potentially harmful bacteria, yeast or parasitic organisms prevail. In addition to boosting sIgA levels, S. boulardii promotes gastrointestinal health by competing for space and nutrients against pathogens.